We have a community Advent calendar in Fernie, where one window is opened every day in 24 locations around Fernie to display original advent themed works by 24 artists and artisans on a 12″ x 12″ canvas. 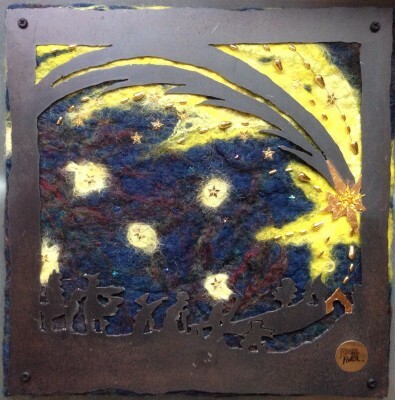 I thought I’d share my felt and steel piece with you, called “Follow that star”. The yellow hues in the night sky are made from alpaca fibre dyed with marigold flowers and onion skins. The star, embellished with gold leaf, illuminates the precious gift awaiting those who search for it every Christmas. As part of this community event, Knox United Church will open the window outside their building on December 15 to reveal my work. The news has also been included in an e-bulletin published by Kootenay Arts.